This year’s Great American Beer Festival (GABF) has ended. The event is always a good place to learn about beer, taste great beers from around the world, and meet brewers and beer lovers. GABF, however, is more than one large party at the Colorado Convention Center. Many pre-GABF events occur in and around Denver. 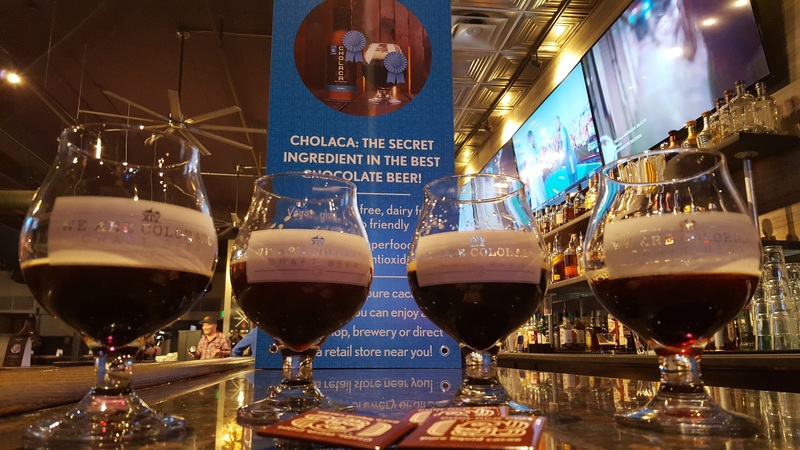 One of these events, centered on chocolate beer made with Cholaca, pure liquid cacao, was help the Monday before GABF kicked off. Myself and Allan Parr, both writers for EatDrinkBoulder.com, attended, with our guests, and we all learned much about chocolate beer. 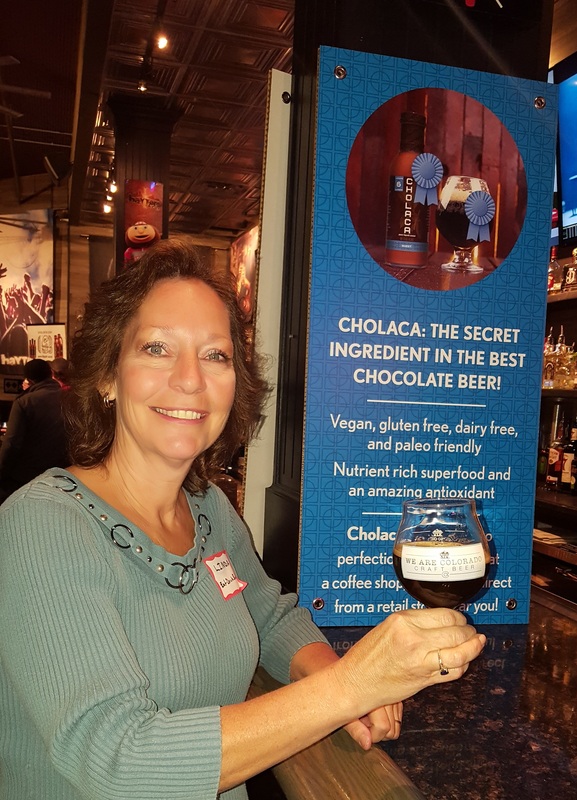 The event, “How to Brew the Best Chocolate Beer with Cholaca” was held at the Tap 14 Beer Garden in downtown Denver. Four local breweries were represented– Copper Kettle Brewing Company, Left Hand Brewing Company, Oskar Blues Brewery, and Sleeping Brewing Company—each sending a Brew Master to discuss chocolate brews, and Cholaca specifically. 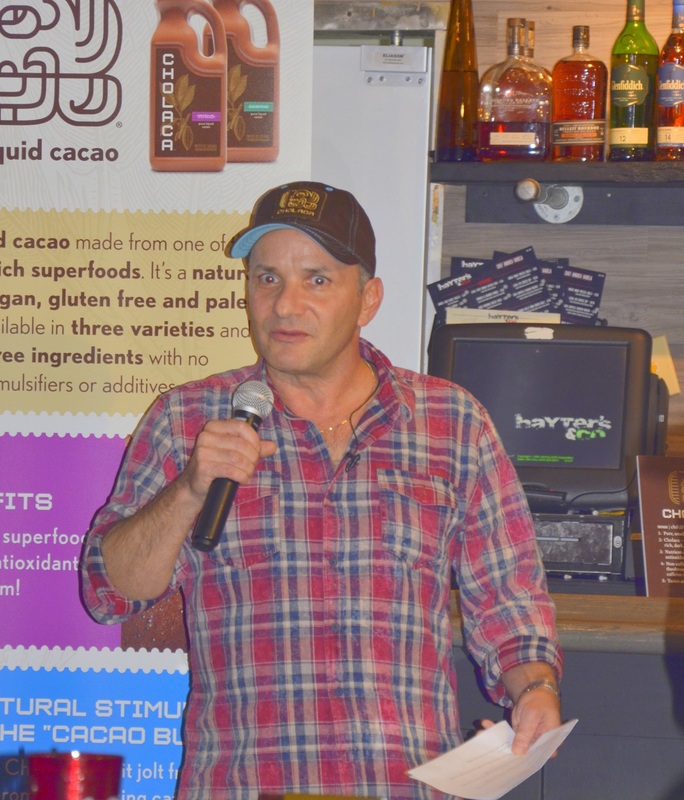 All breweries brought beers created with Cholaca pure cacao, and during the evening, three of the four brewers held a round-table discussion about their beers and their brewing process. Although this was clearly an event paid for by Cholaca, which is sold in twelve and thirty two ounce bottles, the brewers were independent, iconoclastic connoisseurs of beer, not easily swayed by corporate hype. They see Cholaca as a true innovation and were quite analytical in their praise. More about this later. We were greeting at the door by two Cholaca staff; Mike Ross, the head of production and Ira Leibtag the founder and CEO of Cholaca. Before the event started, they told us of the origins of Cholaca (founded in 2012), where the cacao comes from (Ecuador and Peru), the benefits of Cholaca (it is vegan, gluten free, dairy-free, and Paleo friendly), and where we could buy Cholaca (Alfalfa’s, Whole Foods, and Natural Grocers, to name a few). Mike also brought us samples of the four beers on tap. We took our beers to the “Press” table set up for us, and tried them. All four beers were unique in their approach to using Cholaca, none tasted like any of the others. All were good, and all had definite hints of chocolate. I consider all four to be fine sipping beers, though not the type of beer I would order on a hot day to cool off. The Mexican Chocolate Stout by Copper Kettle was my favorite, and in fact the favorite of majority of our table. It had deep hints of chocolate, cinnamon, and coconut, followed by a mild pepper aftertaste. It had a nice dark-brown color, and went down smooth. The Lotta Cholaca Love Porter by Left Hand was also smooth to drink, with milder hits of chocolate. I found this beer to be very easy to drink and would definitely make for a great winter brew. The Rum Barrel-Aged Death by Coconut by Oskar Blues was by far the strongest of the four beers. It had a nice aroma, but heavy on the rum flavoring from the barrels. If you like beers that are aged in liquor barrels, this is a good beer for you. Finally, the Sangre de Coco Imperial Brown Ale by Sleeping Giant was very smooth, had a nice chocolate taste, and in some ways, tasted the most like a traditionally-brewed beer. The Tap 14 Beer Garden put on a great presentation, complete with great food to accompany the beer, and great service. We sampled our beers and had some food, while listening to three of the brewers talk about their beer and brewing processes. The “Brew Masters” panel consisted of Jeremy Gobien from Copper Kettle, Steve Brockwell from Left Hand, and Chris O’Connor from Sleeping Giant. After Ira Leibtag spoke for a few minutes about Cholaca, Mike Ross led the discussion with the three brewers. Many questions were asked about how they incorporated Cholaca into their beers, and all three brewers had a chance to answer the questions. They spoke about how they came up with their recipes, when they added the Cholaca to the beer (some into the mash and others during second fermentation), its advantage over cocoa nibs (it integrates and much more easily and predictably), and then gave tips on how to best incorporate Cholaca for best results. Mike then asked members of the audience for questions. Several were asked, and the three brewers did a great job of answering the questions. At the end of the discussion, several sources were given for where to get more information on Cholaca and on brewing with chocolate. One resource, the Chocolate Beer Lovers Facebook page (https://www.facebook.com/chocolatebeerlovers/) is a great place to go to share stories about chocolate beer. The Website for Cholaca (https://cholaca.com/) is also a great place to go to learn more about Cholaca, find out where to purchase Cholaca, and find great food and drink recipes using Cholaca. If you find yourself visiting one of the breweries who shared their chocolate beers, definitely try one for yourself. With the great information I learned from the brewers, I will soon buy some Cholaca and make a small batch of a chocolate stout.